Design and create a unique sculptural vessel using pure merino wool in this inspiring one-day creative workshop. Textile artist Denise Lithgow will guide you through the process of making and moulding felt into innovative forms and shapes. 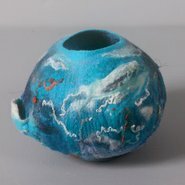 You’ll learn how to form shapes and translate these into three-dimensional non-functional vessels. You’ll have the opportunity to explore works from the Gallery’s collection, or you can bring your own photos for inspiration. Suitable for beginners to experienced felters. No drawing skills required.